The indoctrination of Gerrit Wolfaardt is complete: his family traditions, history, culture, even his church, have taught him that black South Africans are a cancer in the land. Under the eye of prominent members of the government and military, Gerrit develops a diabolical plan to rid South Africa of its "black danger." Before his plans can be carried out, he meets two people who will put him on a collision course with his future: Celeste, an open minded university student, and Peter, a pastor who challenges Gerrit's prejudice. 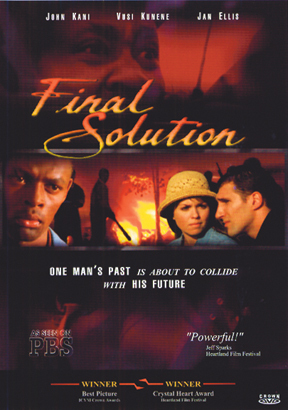 His "final solution" meets its greatest obstacle when Gerrit himself realizes he is wrong. The Persecutor becomes the Peacemaker and begins to seek reconciliation between whites and blacks. However, in the turbulent last days of apartheid, there are those who doubt his transformation. One such person is Moses Moremi, whom Gerrit had once violently attacked. In the film's dramatic conclusion, it is Moses who must choose between peace and bloodshed. Based on a true story. Not Rated: Parental Guidance Suggested -- Scenes of violence not suitable for younger audiences.